Nominated in the International Golden George Awards for the 2nd Year Running! – Your vote is needed!! The voting link opens on 28 February and is http://teddybaer-total.de/contest/online-voting/ All the votes get added for an Audience Award. Not successful in being nominated but still up for an Audience Award are my other two entries – Edmund in Category 1 Premium and Grandpa in Category 2 Premium – they are both longing for your votes too please! – Photos below to help you. The Awards ceremony is held in Germany in April and we are off there for this and the ‘Teddybear Total’ exhibition event in Munster 27-28 April. The Golden George Awards are highly coveted awards with a huge number of international participants from more than 20 countries competing against each other in various categories. 3 nominees in each category are selected and a final winner from these receives a Golden George statue about 25cm high of bronze and weighing about 2 kilos! The nominees (ie 2ndand 3rd) each receive a bronze head on a plinth. You may remember that last year my lovely bear Stewart MacBear was nominated and we went to the exciting Oscar-like Golden George Awards night to receive the nominee’s Golden George Award which is a bronze teddy head on a plinth . Having visited the event last year and been so excited to receive an award, I thought I must face the challenge again but with extremely little hope of being successful having seen the high standard of absolutely exquisite bears are entered – and so many of them. The different interpretations of the teddy bear style by the different artists throughout the world really inspired me and also, I learned from some of the artists about adding armature to the bears arms and legs so they are more poseable. The artists who actually add real teeth and claws to the ‘natural’ bears I greatly admire, but I seriously don’t think my skill sets lead me on that direction! 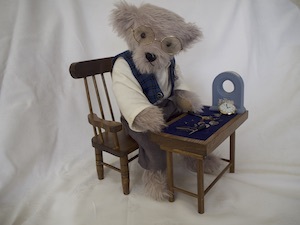 This is the entry that has been successfully nominated – The Clockmaker I am really proud of him. I had such fun in working our how I was going to design him. He is made from a lovely Schulte lilac beige mohair from Germany and I have made his legs longer than usual ( he is 18” 45.5cm tall) and inserted armature in both these and his arms so I can pose him to sit in his chair at the table and seemingly work with his tools and of course I weighted arms, legs and tummy with steel shot to help with the shaping and styling of his limbs I made all his clothes, his trousers are in a fine grey baby corduroy and he has a formal shirt with bow tie and a tartan waistcoat with a little pocket watch attached. 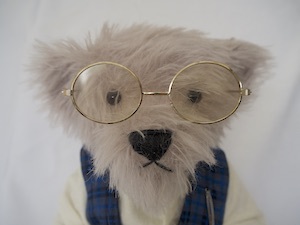 Then he really needed some steel rimmed glasses so he can study his clockwork materials on his felt topped table as he sits working of the customers Wedgewood clock. A lot of hard work and love was put into this bear! 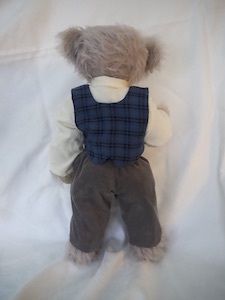 I also entered two other bears, one was the super Edmund, a great bear made from real teddy bear type mohair in an old gold with black tips colour. He has such a great face and character and also I put a growler in him so he makes that fantastic teddy bear sound when you tip him! He is 26cm (10 ½ “) tall and just wears a bowtie! Then comes Grandpa, with armature and steel shot weighting again like the Clockmaker, he stands on longer legs also and measures 48cm (19”) tall. He wears wire rimmed glasses as he walks with his walking stick and his knitted jacket and cap are handmade. Fingers Crossed everyone that we will come home with the Golden George statue this year. Thank you with lots of hope!